I have been searching for a long time and I think I have finally found my Holy Grail (HG) eye makeup remover and it is WATER. 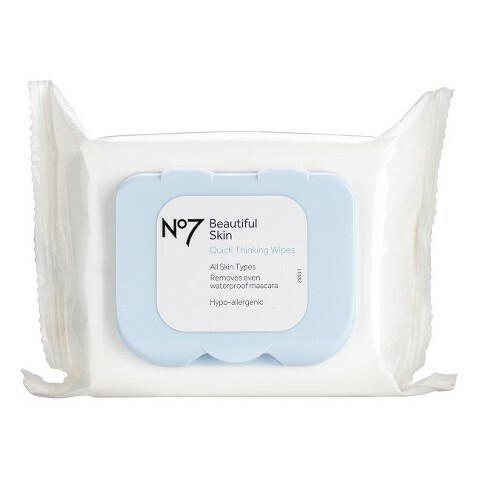 Let’s back up to the beginning of my makeup removal routine… as soon as I get home from work most days I run to my bathroom to grab a Boots No7 Beautiful Skin Quick Thinking Wipe and take off all of my face makeup. I just hate that feeling of it half melted sitting on top of my skin at the end of the day- ew. And although these wipes say they remove even waterproof mascara that’s a LIE! Sure maybe if I held one on each eye for 90 seconds and then rubbed at my lashes until half of them fell out I might get some mascara off, but that’s not how I’m trying to live my life. The wipes are, however, wonderful at taking off face makeup and are non-irritating and always stay wet until I use the very last one and are affordable. These were in my August 2014 favorites post and they are the only wipes I’ve used for a year now! I buy these bad boys in bulk, but they absolutely do not remove my mascara. 1. The Solid Beauty Blendercleanser retails for $16 so I recommend getting it in a value package with a beauty blender. For example you can get 1 beauty blender (typically $20) plus a full sized Solid Blendercleanser for $25. Is the Solid Blendercleanser just an overpriced tiny bar of soap? Probably, but I used to rub my first beauty blender on a bar of Dove soap thinking it was the same thing and I tore it up VERY quickly which is why I purchased the Blendercleanser this time. 1. Remove foundation from face and neck with a nice soothing gentle makeup remover wipe. I will wipe my eyeshadow off with the wipe as well, but if some is left over that is fine. The wipes I use (and I mentioned in my August Favorites) are Boots No7 Quick Thinking Wipes and definitely get the value pack. These have a nice snap closure to keep them from drying out. I try to gently and slowly pull of my falsies if I’m wearing them and you can also put liquid eye makeup remover onto a cotton round and hold it on top of the falsies to loosen them up before removing them. These Boots No7 wipes say they will remove waterproof eye makeup, but I wear about 10 coats of mascara and if I try to remove it with these wipes I’d be in my bathroom all night scrubbing and when I was done I wouldn’t have any lashes left. Luckily I do know of a product that will do this for you in the next step!